Hi people! So... yeah. Game is in progress, i ended up liking a lot the idea I had, so I've been working on it. The story scope will be kept as I originally planned. But the game will have more "meat". The puzzle game (I've named it Marble Fight for now, super creative) will be used for solving certain problems, generally speaking people in this world is weird and they solve ABSOLUTELY EVERYTHING by playing this puzzle. Because why not. Also EtherealElen is a REACTOR scientist. Because reasons. Here is a changelog from what I can collect I've done in the mean time. - General board design and graphical assets. - Basic marble interaction (swap marbles). - Boards now support waiting (while marbles are doing something), stop (i.e. victory/defeat/pause) and player control variables. - Marbles now support changing colors and having an inner icon. - Item and effect database elements created. - Inventory basic functionality (main game). - Inventory GUI (main game). - Call puzzle from event. - 7 x 10 matrix. 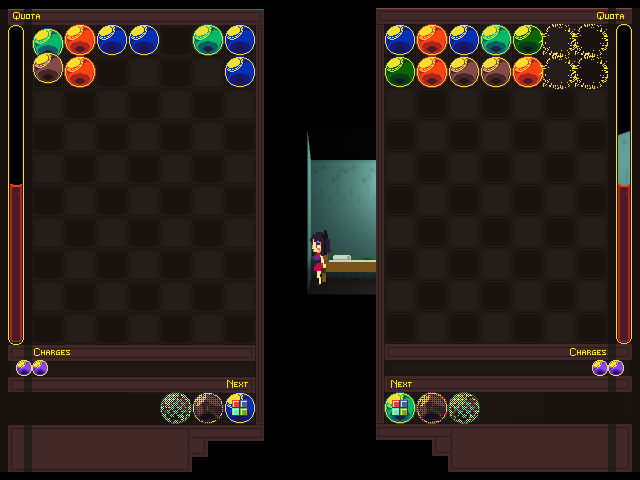 - Change "filling board" to falling board (swap tile puzzle to falling blocks, Bejeweled TO Magical Drop/PuyoPuyo). - Not fill board at start, instead drop 2-4 rows at start. - Drop one row each X time. - Check for existant pops. - Check for pops only for moving marbles. Create a list with swapped coordinates and falling blocks only. - Special marbles support: create special marble list from inventory item list. - Effect/items graphics. They should show something. Thanks for reading, and jeezus, this actually looks like an actual devlog now!